Structure of an intestinal villus. A villus is one of many short fingerlike projections (plural villi) that project from some membranous surfaces. 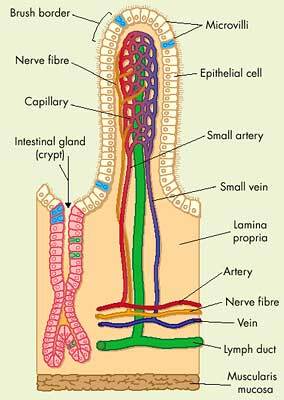 Numerous intestinal villi line the small intestine. Each contains a network of blood capillaries and a lacteal. Their function is to absorb the products of digestion and they greatly increase the surface area over which this can take place. Chorionic villi are folds of the chorion (the outer membrane surrounding a fetus) from which the fetal part of the placenta is formed. They provide an extensive area for the exchange of carbon dioxide, oxygen, nutrients, and waste products between maternal and fetal blood. See also chorionic villus sampling. 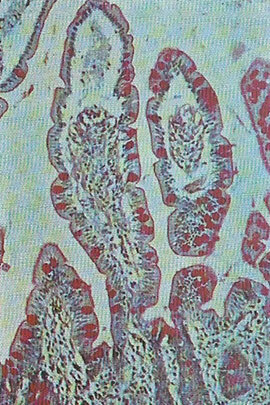 The villi are seen here in cross-section . They present a large area for the absorption of nutrients from the partially digested food reaching the intestine from the stomach.